The challenge for the Emergency Physician is in making the diagnosis of acute aortic dissection and in doing so as expediently as possible as the mortality rate is 1-2% per hour. It is often a difficult diagnosis to make due to the multitude of different clinical presentations of the disease. 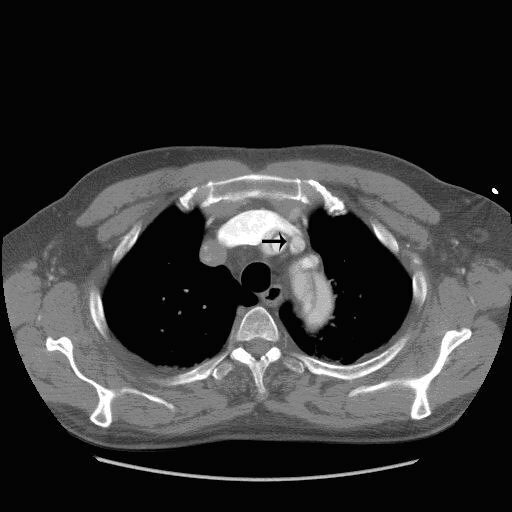 The aim of this review is to provide a firm knowledge base about aortic dissection and to increase its consideration in the differential diagnosis of any patient with appropriate signs and symptoms of the disease. The image illustrates an aortic dissection from the ascending aorta into the descending aorta. Aortic dissection occurs following a tear in the aortic intima with subsequent separation of the tissue within the weakened media by the propagation of blood. At the point of dissection the aorta is NOT aneurysmal and the term dissecting aneurysm is incorrect and may be misleading. A ruptured or leaking abdominal aneurysm is a different disease, requires immediate surgery with only occasional need for any imaging, can be performed in most hospitals by a vascular surgeon and does not require the use of cardiopulmonary bypass. 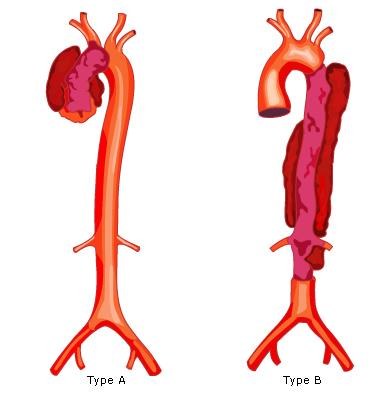 There are 4 different classifications of aortic dissection and the commonest one used is the Stanford classification dividing them into Type A and Type B. A type A dissection involves the ascending aorta and/or the arch whilst type B dissections involve only the descending aorta and occur distal to the origin of the left subclavian artery. 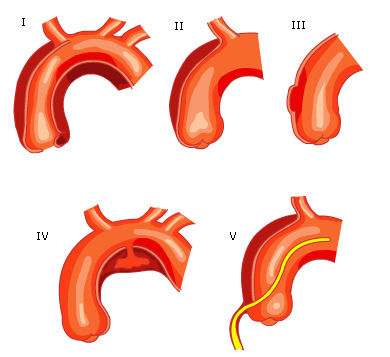 The other commonly used classification is DeBakeys classification which divides aortic dissections into 3 types: I, II and III (Figure 1). Type I dissections involve the entire aorta whilst type II only involves the ascending aorta and, or the arch of the aorta. Type III involves only the descending aorta. Reul and Cooley further subdivided De Bakeys classification into subtypes IIIa and IIIb. In IIIa the dissection involves the aorta just distal to the left subclavian artery but extends proximal or distal to this but is largely above the diaphragm. In IIIb the dissection occurs only distal to the left subclavian artery and may extend below the diaphragm. A more recent classification has been made by Svensson, because intramural haematoma and aortic ulcers may be the only signs of evolving aortic dissection and are not accounted for in the other classification systems. Aortic dissection occurs following a tear in the intimal layer of the aorta with subsequent anterograde or retrograde flow of blood within the outer third of the tunica media. It is thought that this occurs because of medial degeneration and certain conditions predispose to this (see Table 1). Notably essential hypertension is by far the commonest risk factor being present in approximately 70% of cases. It causes weakening of the tunica media layer of the aorta. Marfans Syndrome is associated with an inherited connective tissue disorder resulting in a weakened aortic media and progressive aortic dilatation. Marfans Syndrome is likely to be present in 50% of cases of dissection presenting under the age of 40. Bicuspid aortic valve is associated with aortic root dilatation and with a congenitally weakened aortic wall. The channel created by the dissection process is called the false lumen and occasionally the blood may re-enter the true lumen through a more distal tear in the intima. The majority of intimal tears occur in the ascending aorta (see Figure 1) due to greater pressure on the aortic wall as it is closer to the left ventricular outflow. Once the dissection process occurs blood tracks through the media to varying degrees and may dissect down from the aortic root to the bifurcation of the common iliac arteries in a matter of seconds and typically causes maximum pain at this time. aortic dissection from the ascending aorta extending to the bifurcation of the common iliacs. AAD can result in rupture of the dissection into various body cavities (see Table 2). Smaller branches may be simply compressed at the point of origin without the dissection progressing within the tunica media. The dissection progresses within the media of the branch vessel and the false lumen becomes so large it compresses the true lumen of the vessel. Occasionally an obstructed branch vessel can have its blood flow restored either because of a re-entry tear into the true lumen or because an intimal flap only intermittently obstructs the origin of the vessel as the flap extends or moves with aortic blood flow. This occurs when the dissection process extends into or around the aortic valvular support. When this happens the aortic root can dilate so much that the aortic leaflets cannot fully appose during diastole thereby allowing regurgitation of blood through the cusps. The resultant murmur may be of any grade of intensity and may be inaudible if there is associated haemopericardium. Patients who survive the dissection process may have a delayed presentation with cardiac failure. A substantial amount of what we now know about the disease is due a large series of patients in a review by Hirst (1) and also to the ongoing data submitted to the International Registry of acute Aortic Dissection (IRAD) (2). The history is the most essential part of the assessment of a patient as it will be the patients symptoms that will alert you to the possibility of aortic dissection. The most common symptom is pain and in 85% of patients in the IRAD series this pain was abrupt in onset. The pain is often so sudden that the patient can describe exactly what they were doing at the moment of onset and the pain is almost always at its maximum at this point. This history helps distinguish between the pain of aortic dissection from the more gradual onset of chest pain that occurs with acute coronary syndromes. In addition the pain of aortic dissection is commonly sharp in nature whilst it is described as an ache or tightness in acute coronary syndrome. The classic tearing interscapular pain was found to occur in only 50% of patients in the IRAD series regardless of whether they had a type A or type B dissection. The pain in aortic dissection occurs in the anterior chest 70-80% of the time in patients with a type A dissection and back pain occurs only in 50% of all patients (2) . Abdominal pain was found to be the third commonest site of initial pain and other sites described were the throat, neck and extremities. Patients may also describe the classic migration of pain from the chest, back or abdomen to one or more limbs or to the neck and this is thought to be due to peripheral extension of the dissection from the primary intimal tear. The physician must beware that the pain, however severe initially, may completely resolve by the time the patient presents to hospital and often this is because the dissection process has for the moment stopped or there is relief of the pressure within the aortic wall by the spontaneous re-entry of blood back into the true lumen. It is on these features alone that the physician should suspect aortic dissection even if subsequent clinical examination and other bedside tests do not support the diagnosis. This suspicion should be raised further if the patient has any of the predisposing factors such as hypertension, Marfans Syndrome, etc. In 5-15% of patients however, no pain occurs at all and this is typically the case in those patients presenting with syncope, stroke, congestive cardiac failure or the elderly. The physical examination of these patients needs to be thorough but also must be done quickly. 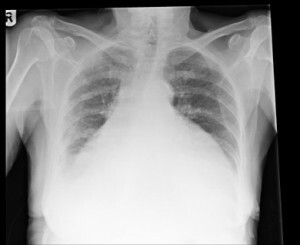 The chest should be specifically examined for a pleural effusion which may represent a haemothorax. If the patient is hypotensive one must quickly determine whether this is secondary to hypovolaemia, pump failure or neurogenic as the treatments for each of these is very different. Hypovolaemia may be caused by a massive haemothorax, loss of blood into an extensive aortic wall false lumen, bowel ischaemia with or without haematemesis or retroperitoneal haemorrhage. Cardiac failure can be secondary to haemopericardium with tamponade; left ventricular dysfunction due to myocardial infarction as a result of a coronary artery dissection (3,4,5) ; or complete heart block following haemorrhage into the interatrial septum (6,7) . Neurogenic shock can simply be caused by spinal cord ischaemia or infarction and should be considered when the patient has an obvious para- or tetraplegia with bradycardia and hypotension and warm peripheries. Abdominal examination is essential to exclude other potential causes of the patients symptoms such as pancreatitis, perforated hollow viscus and ruptured abdominal aortic aneurysm. The 12 lead electrocardiogram is not as helpful as one may think in distinguishing aortic dissection from acute coronary syndrome as it is only completely normal in 30% of patients with dissection. In the IRAD series 3% of all aortic dissection patients had ST elevation myocardial infarction pattern; 15% acute ischaemic changes and 41% had non-specific ST segment and T wave changes. If the history suggests aortic dissection, a diagnosis of acute coronary syndrome should not be made even if the ECG has obvious STEMI or NSTEMI patterns as antiplatelet treatment, heparin or thrombolysis may worsen the prognosis of the patient. It is always better to withhold these treatments when aortic dissection is considered and immediately arrange for urgent aortic imaging to clarify the diagnosis. 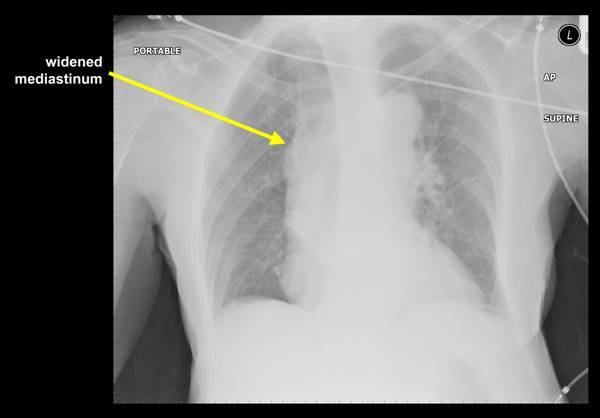 The portable erect chest x-ray is very helpful as it may demonstrate mediastinal widening or provide another diagnosis for the patients symptoms e.g. 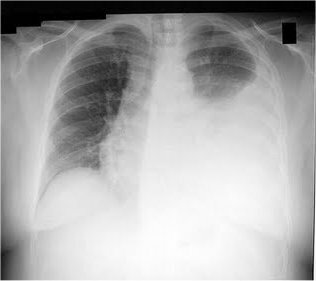 spontaneous pneumothorax. 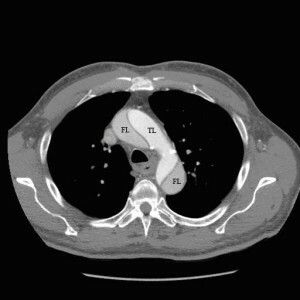 Mediastinal widening (see Figure 2) however is only present in 60% of patients with dissection and other radiological signs are important to elicit (see Figure 3). These are an abnormal aortic contour which occurs in 50% of patients; a soft tissue shadow peripheral to a calcified aortic annulus which occurs in 15% of patients and represents blood within the false lumen extending around the aortic annulus; a globular heart may suggest haemopericardium and a pleural effusion may represent a haemothorax(8). A pleural effusion, representing a haemothorax (invariably massive) occurs in 20% of patients. 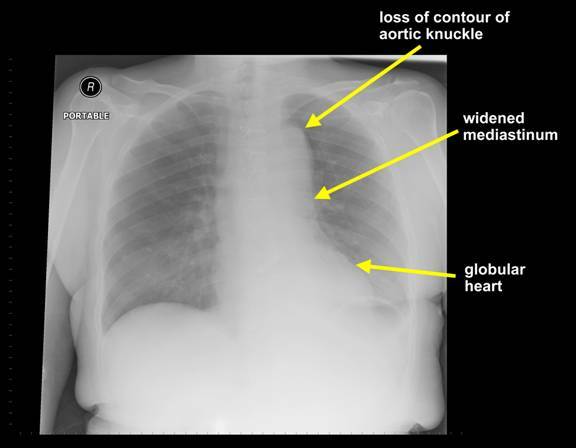 This typically occurs when the dissection process involves the descending thoracic aorta, and when rupture occurs here it is almost always into the left pleural space. A soft tissue shadow peripheral to a calcified aortic annulus occurs in 15% of patients. It is however possible to have a normal chest radiograph and this occurred in 12% of patients in the IRAD series. Although transthoracic echocardiography (TTE) can be performed at the bedside in the resuscitation room it must not delay more definitive investigations such as CT or transoesophageal echocardiography. TTE may help make the diagnosis of aortic dissection by identifying a free intimal flap within the aortic lumen but its sensitivity is approximately 80% for type A dissections but only 50% for type B (9). Such imaging rarely identifies the extent of the dissection and a more definitive investigation is always required. It does however accurately detect a pericardial effusion, aortic regurgitation and the degree of aortic valvular disruption all of which provide valuable information for the surgeon. It is therefore ideally performed whilst awaiting interhospital transfer or whilst awaiting theatre in centres with Cardiothoracic surgery on site. Transoesophageal echocardiography (TOE) is an ideal test because it can be performed in the resuscitation room, has a sensitivity of 90-98%; can easily delineate the extent of the dissection and can visualise the aortic root and valve (9). In the UK, this test is limited by its availability out-of-hours. It can also cause surges in blood pressure whilst instrumenting the awake patient particularly if the operator is inexperienced in its use. Aortic dissection is diagnosed on CT by identifying two distinct lumens with a visible intimal flap (see Figure 4). It can also delineate branch vessel involvement, visualise the entire aorta and has a sensitivity ranging between 83 and 100% (9). CT will also reveal pericardial fluid (see Figure 5) which is not a direct confirmatory test for aortic dissection but will suggest this diagnosis in the right clinical context. A distinct advantage of CT over other modalities of aortic imaging is that currently most hospitals in the UK are able to transfer these images to a regional cardiothoracic centre if required. This gives the surgeons adequate information on whether to transfer the patient and allows them to plan the type of surgery required prior to patient arrival. The sensitivity of CT detection for AAD is not yet 100%: it may miss a dissection if there is complete thrombosis of one lumen or if there is similar opacification of both the true and false lumens; also, intramural haematoma may be missed as the findings are often subtle and only evident on pre-contrast images. 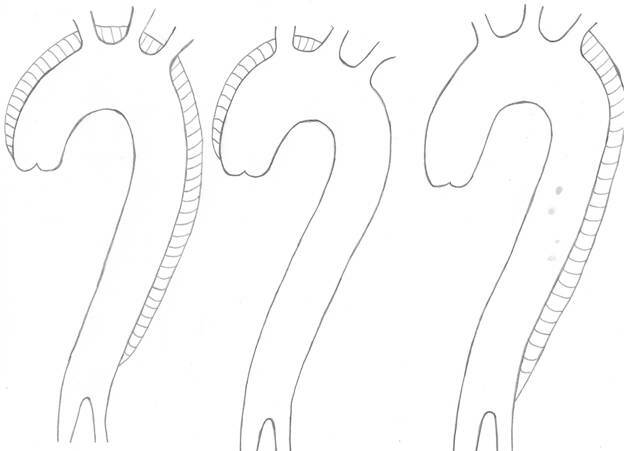 Figure 4: Aortic dissection The arrows demonstrate the intimal flaps in both the ascending aorta (anterior) and the descending aorta (posterior). TL is the true lumen as this has contrast within it whilst the darker false lumen (FL) does not. The image illustrates two distinct lumens at the level of the arch of the aorta. The arrow on the image demonstrates a dissection flap within the left common carotid artery as it comes off the arch of the aorta. CT will also reveal pericardial fluid which is not a direct confirmatory test for aortic dissection but will suggest this diagnosis in the right clinical context. 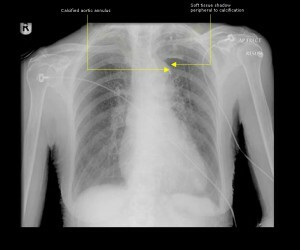 The white arrow highlights the pericardial fluid. Although these imaging modalities can be used to detect aortic dissection they are rarely used (9). MRI requires that these critically ill patients be placed on different monitoring which is magnet-proof and doesnt allow for quick access to the patient should they deteriorate once the scan has commenced. MRI at the moment also takes considerable time to acquire the necessary images. Aortography is invasive and is not performed at most hospitals. It is now rarely used as non-invasive imaging can provide the required information. It is essential that there is an agreed imaging modality for patients with suspected aortic dissection in individual hospitals and that the regional Cardiothoracic surgeons are happy to act on whatever imaging is to be used (10). Patients with suspected dissection are often in pain and opiate analgesia is important both for comfort and to reduce the sympathetic response to pain which itself can cause progression of the dissection process. 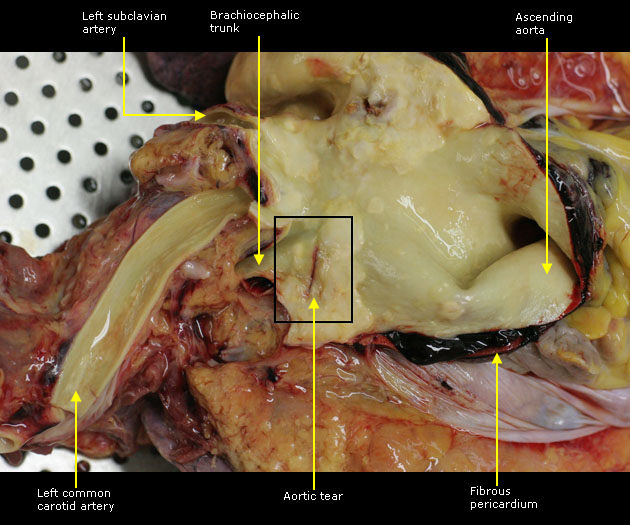 Type A dissections require open surgery to prevent rupture into the pericardial sac. 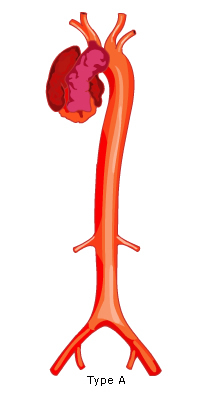 Type B dissections are managed medically but may require endovascular stenting if the patient has persistent pain, a rapidly expanding aortic diameter, or malperfusion of branch vessel organs. It is important that patients with a type B dissection are still managed in a High Dependency Unit and referred to a vascular interventional team if complications arise (11-14). It is vital that patients with suspected or proven dissection should have their blood pressure actively reduced if higher than a systolic of 120 mmHg otherwise the dissection process may progress. In order to facilitate this an arterial line must be placed; intravenous labetalol (a mixed – and -blocker) is the ideal agent to be used in this setting (15). Labetalol is both an alpha and beta- blocker and should be given as an initial bolus and then as an infusion with invasive arterial monitoring used to guide the actual dose. Vasodilators and -blockers must not be used on their own. If a vasodilator is used it will cause a reflex increase in contractility of the left ventricle which will potentially worsen the dissection. A -blocker may cause unopposed alpha receptor stimulation with increased peripheral vasoconstriction. These agents can, however, be used to good effect if administered together. The characteristics of the drugs used to manage hypertension in AAD (either singly or in conjunction) are presented in Box 1.
and -blocker: Labetalol 0.25mg/kg (usually 20mg) as a bolus over 2 minutes. Maintenance infusion 50mcg/kg/min for 4 mins. 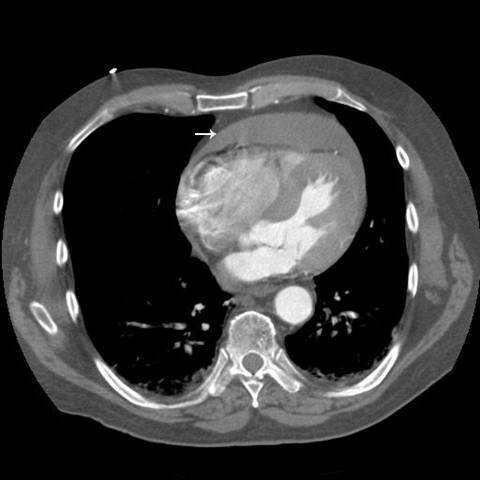 In patients with haemopericardium it is imperative that pericardiocentesis is not performed as a number of case series have demonstrated that rapid decompression of the pericardium can restart fresh bleeding with rapidly fatal consequences (16,17,18) . It is thought that the pressure gradient between the false lumen and the pericardial sac is suddenly increased when pericardiocentesis is performed thereby causing sudden and catastrophic bleeding into the pericardial sac. As a result of this case series and several case reports also highlighting this problem, the Recommendations of the Task Force on Aortic Dissection also discourage pericardiocentesis in this context(19). Patients with a type A dissection require urgent transfer for cardiothoracic surgery: many patients die whilst waiting especially when an inter-hospital transfer is necessary. A meta-analysis of endovascular stent-graft placements for type B AAD showed that the procedure was successful in 95% of the patients selected for such treatment (13). Depending upon the aetiology of the branch vessel occlusion either a stent placed in the origin of the vessel or percutaneous balloon fenestration can be used to alleviate pain or other complications. 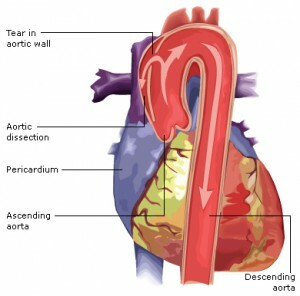 Aortic tears occur most commonly in the ascending aorta; subsequent haemopericardium is the leading cause of death from AAD. 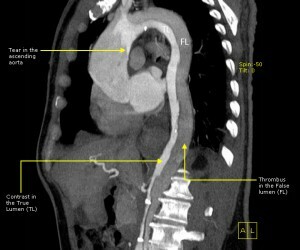 The aorta may dissect along its entire length in only a few seconds and the patient may be subsequently aymptomatic at the time of presentation to hospital. An abrupt or sudden onset of thoracic pain occurs in 85% of patients with aortic dissection. The presence of an aortic diastolic murmur in the dyspnoeic patient must always alert the physician to the possibility of aortic dissection. Pulse deficits, including a significant difference in BP in both arms, only occurs in 20% of patients. 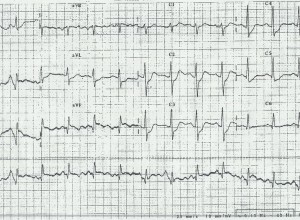 The 12 lead ECG is only completely normal in 30% of patients with more than 40% having ST segment or T wave changes. Patients with proven or suspected aortic dissection who have a pericardial effusion must not have pericardiocentesis performed even if cardiac tamponade is present as this procedure may cause sudden death n this context (Grade C). Hypertension in suspected or proven aortic dissection must be aggressively treated with intravenous labetalol using invasive arterial monitoring to reduce the progression of the dissection process (Grade D)The use of only a vasodilator or a -blocker can accentuate the dissection. Patients with a Type B dissection with complications should be considered for endovascular intervention (Grade B). Patients with Type A dissections for whom surgery is considered appropriate must be transferred urgently. There should be an agreement in place between individual hospitals and the regional Cardiothoracic centre on which imaging modality is most appropriate to avoid unnecessary delays. The unwary may change their initial diagnosis of aortic dissection because of a lack of supporting physical signs, a normal mediastinum on CXR or ischaemic changes on the ECG and as a consequence miss the diagnosis altogether. Insufficient time given to obtaining the history, which is pivotal in making the diagnosis. Belief that a normal transthoracic echocardiogram excludes the diagnosis. Lowering the threshold for making the diagnosis of aortic dissection because there is no significant difference in the blood pressures between the arms. Allowing the blood pressure to remain high whilst awaiting tests/transfer or treating them with the wrong drugs eg just a vasodilator or only a -blocker. Hirst AE, Jr , Johns Jr VJ, Kime Jr SW. Dissecting aneurysm of the aorta: a review of 505 cases. Medicine (Baltimore) 1958;37:217-279. Ohara Y, Hiasa Y, Hosokawa S. Successful treatment in a case of acute aortic dissection complicated with acute myocardial infarction due to occlusion of the left main coronary artery. 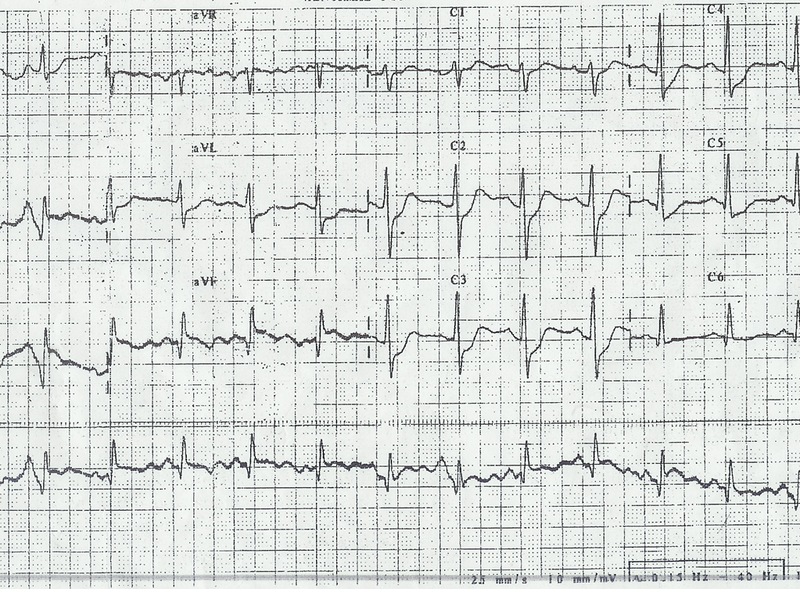 J Invas Cardiol 2003;15:660-62. Horszczaruk GJ, Roik MF, Kochman J, Bakon L, Stokirz P, Pacho C. Aortic dissection involving ostium of the right coronary artery as the reason for myocardial infarction. Eur Heart J 2006;27(5):518. Cardozo C, Riadh R, Mazem M. Acute myocardial infarction due to left main stem compression: aortic dissection treated by direct stenting. J Invas Cardiol 2004;16:89-91. Yacoub MH, Schottenfeld M, Kittle CF. Hematoma of the interatrial septum with heart block seconday to dissecting aneurysm of the aorta: a clinicopathologic entity. Circulation 1972;46:537-45. Thiene G, Rossi L, Becker AE. The AV conduction system in dissecting aneurysm of the aorta. Am Heart J 1979;98(4):447-52. Anand R, Cumberbatch G, Swallow R, Loehry J. Difficulties in the diagnosis of acute aortic dissection. Hosp Med 2003;64(4):241-43. Williams DM, Lee DY, Hamilton BH, et al. 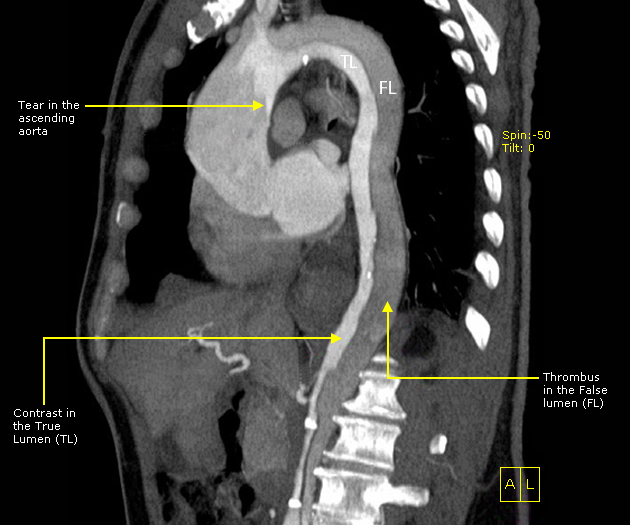 The dissected aorta: percutaneous treatment of ischaemic complications principles and results. J Vasc Interv Radiol 1997;8:605-65. Tsai TT, Fattori R, Trimarchi S, et al. Long-term survival in patients presenting with type B acute aortic dissection: insights from the international registry of acute aortic dissection. Circulation 2006;114(21):2226-31. Grubb BP, Sirio C, Zelis R. Intravenous labetalol in acute aortic dissection. JAMA 1987;258(1):78-9. Isselbacher EM, Cigarroa JE, Eagle KA. Cardiac tamponade complicating proximal aortic dissection: is pericardiocentesis harmful? Circulation 1994; 90:2375-8. Coplan NL, Goldman B, Mechanic G, Mazzuchi F, Halperin JL. Sudden haemodynamic collapse following relief of cardiac tamponade in aortic dissection. Am Heart J 1986;111:405-6. 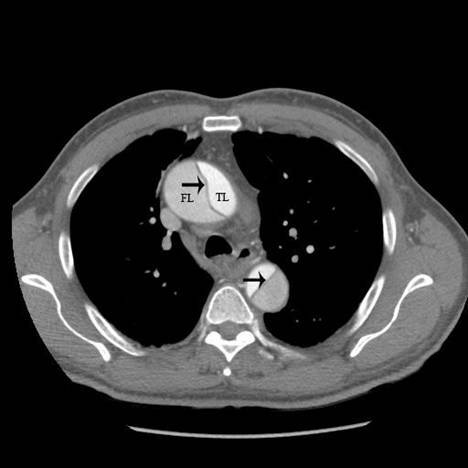 Erbel R et al.Diagnosis and management of aortic dissection. Recommendations of The Task Force on Aortic Dissection, European Society of Cardiology. Eur Heart J; 22(18):1642-81. Sarasin FP et al. Detecting acute aortic dissection in the emergency department:Time Constraints and choice of the optimal diagnostic test. Ann Emerg Med 1996;28:278-288.